We've talked a lot about pests in the dahlia garden. 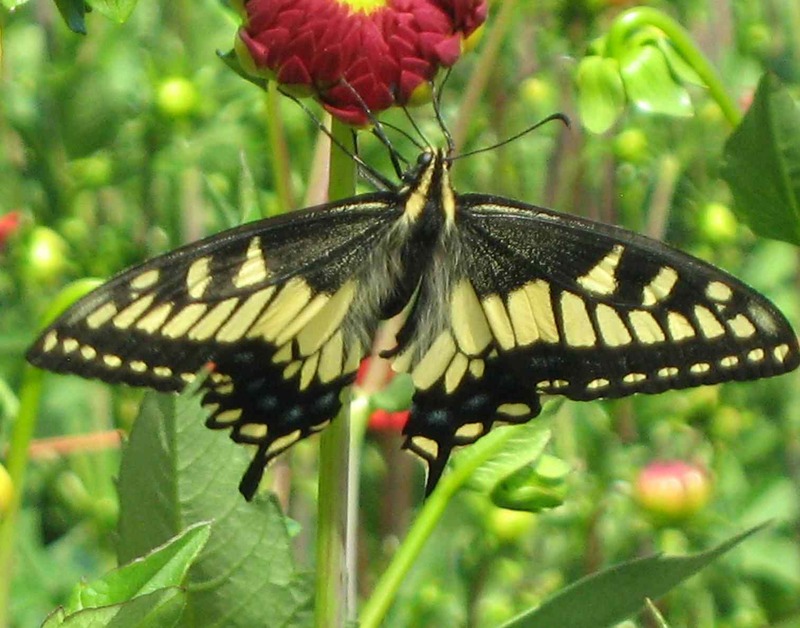 But there are lots of critters you might encourage for their beneficial effects on your dahlias, and on other plants you might want to be healthy and productive as well. Bees are, of course, of major importance. Bees are pollinators, and we need them in our orchards and gardens to pollinate the plants that grow fruits, berries and vegetables. Dahlias, with their composite form, all those little florets, and often those lovely pollen-y centers, are attractive to bees and to butterflies, which are also pollinators. There are other bee-like creatures that may find dahlias of passing interest, and which are useful to gardeners: various members of the wasp family are also predators that help control aphids and the larvae of sawflies and other leaf-eaters. Other bugs are good predators too. Ladybugs, for instance, are great aphid-munchers; in fact, many a dahlia grower whose plants are afflicted with aphids resort to purchasing ladybugs for pest control. Birds are useful garden aids. A healthy population of nesting birds will help keep young dahlias free of aphids and earwigs and other sucking and gnawing bugs. Install nesting boxes and black-oil sunflower feeders for chickadees, for instance, and keep an eye on just how many bugs and little green worms the parent birds bring to the nest box every hour. Swallows and other aerial hunters also keep bug populations down. Even snakes have their uses. 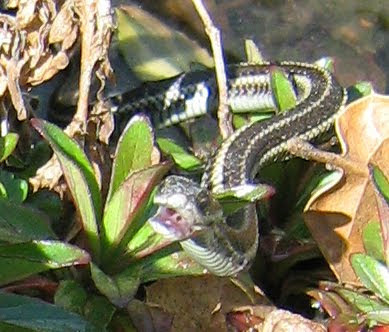 A good-sized garter snake will consume not only bugs but slugs and the eggs of slugs and snails. If snakes' slithery, wriggling style of locomotion causes you what the poet Emily Dickinson called "zero at the bone," as the little guy in the photo did when I encountered it while weeding this spring, you still have to count any critter that eats slugs as a friend.